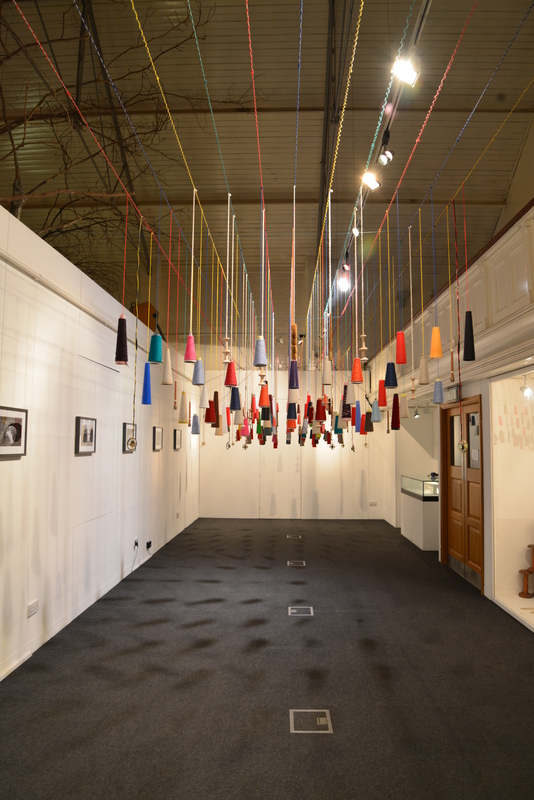 I can’t believe that there is less than a week to go before my Connecting Threads exhibition at The Charnwood Museum, Loughborough comes to an end. 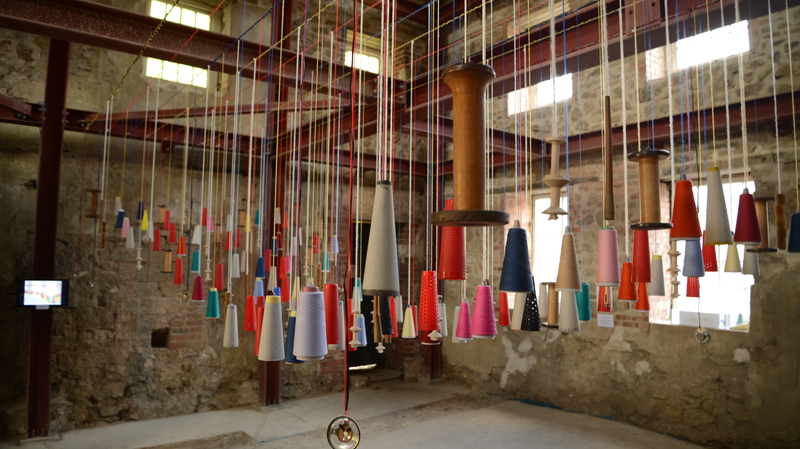 This time next week all the elements will be packed away in boxes and the bobbins returned to Sir Richard Arkwright’s Masson Mills Working Textile Museum! How time flies! It was fantastic to see the work displayed in the museum and I have received lots of great comments! Thanks to all the staff at the museum for their support and help! On a positive note – and this might be small fry compared to some of you out there – but I am really pleased to have had over a 1,000 views on my blog! A big thank you to all those who have helped me reach this figure! 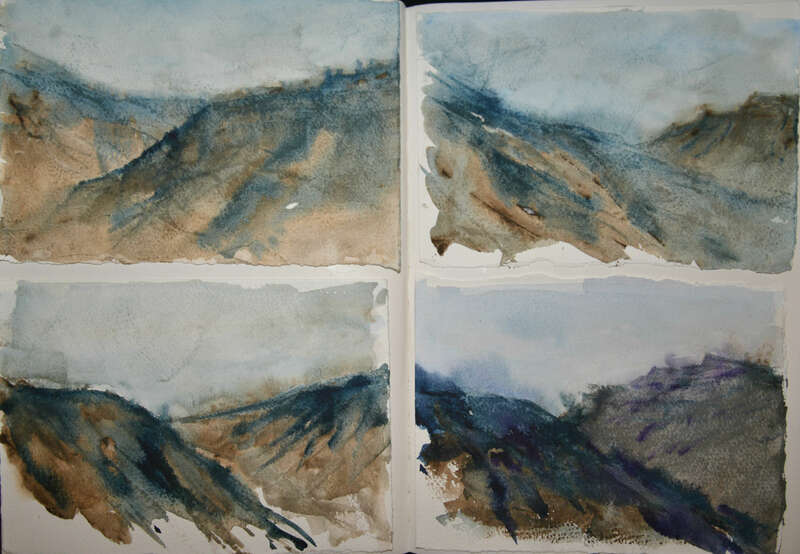 The rain has been a hinderance this week as I really wanted to get out and about sketching more trees in order to submit some work for an exhibition at Blue Owl Art later in the year! 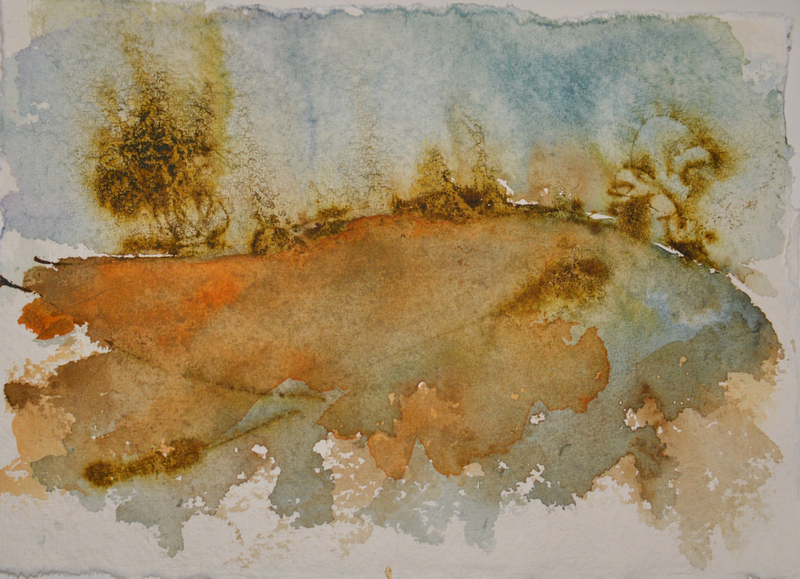 Instead I am indoors, framing work whilst sorting out others that I need to re-do, do more work on etc. I have continued dabbling with watercolours, experimenting with washes, techniques and adding different mediums. 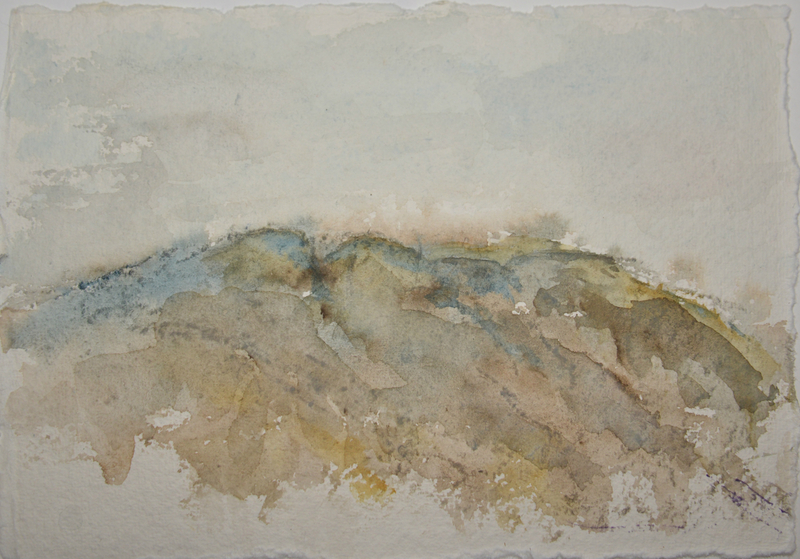 Inspired by the landscapes that I love i.e the moors here are a few of my dabbles! 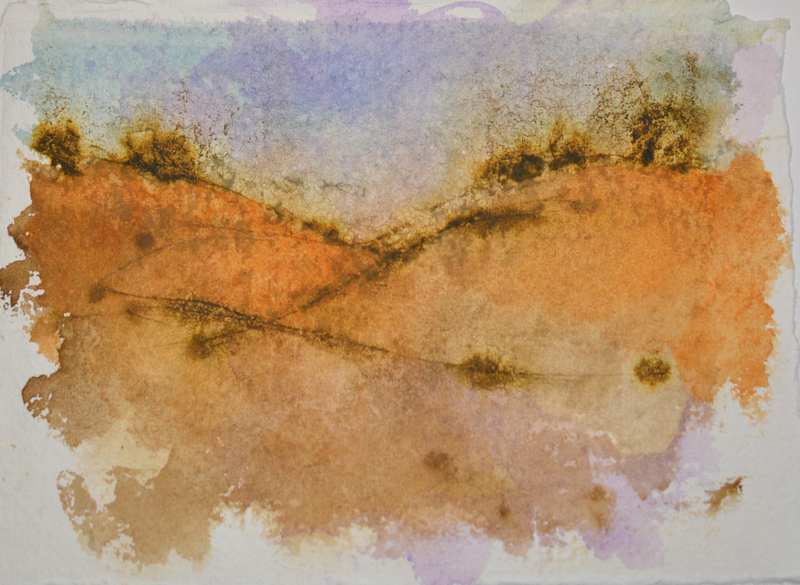 I am really enjoying all this experimenting and am trying hard to keep the work loose and more abstract. 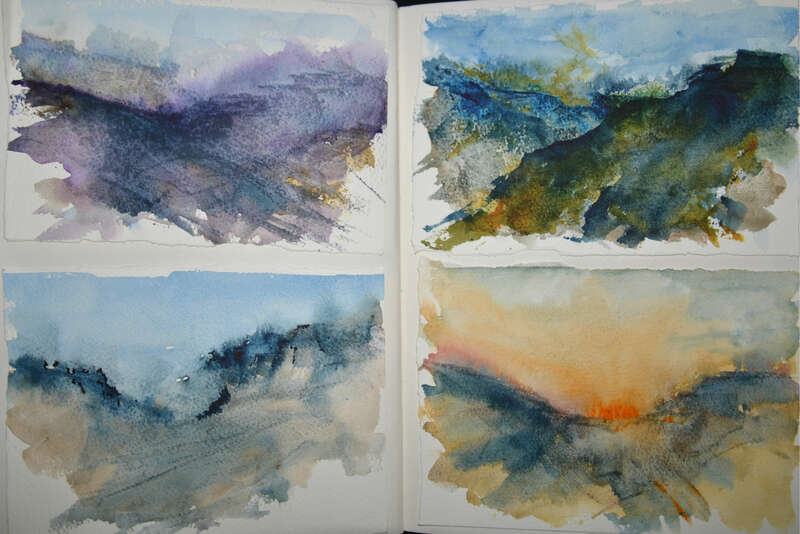 I am tempted to work some of these dabbles into larger pieces – what do you think? 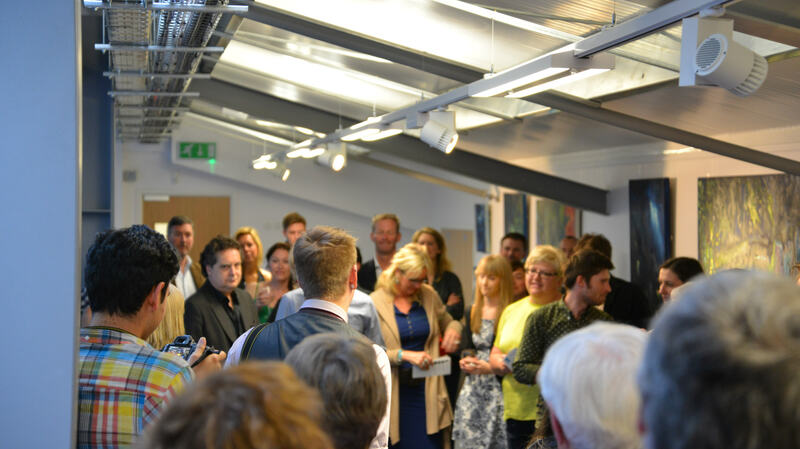 Okay I’ve procrastinated long enough – on with the applications…..
Last night Peter and I went along to the launch event of Blue Owl Art, a new artistic venture based at Grantham Tennis Club, Lincolnshire. Blue Owl Art is owned and run by Jette Rasmussen and Belinda Thomas, two very talented ladies whom I met at Grantham College where we all studied for our Foundation in Art & Design (that seems a long while ago ladies!). Whilst completing their Fine Art Degrees at the University of Lincoln, Jette and Belinda were asked what they were going to do with this ‘arty qualification’ and that’s when the seeds of Blue Owl Art were sown! Their aim was to have a gallery space where they could hold exhibitions, sell art and craft based work and run art events and workshops. 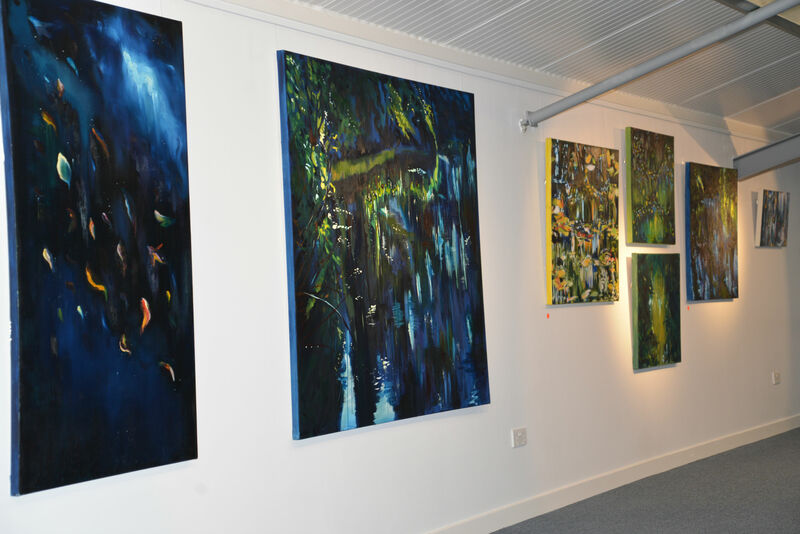 After months of hard work and determination, Blue Owl Art opened its doors for business last night with an exhibition supporting emerging artists Chris Bagnall and Kate Robotham. Like Jette and Belinda, Chris graduated from the University of Lincoln. 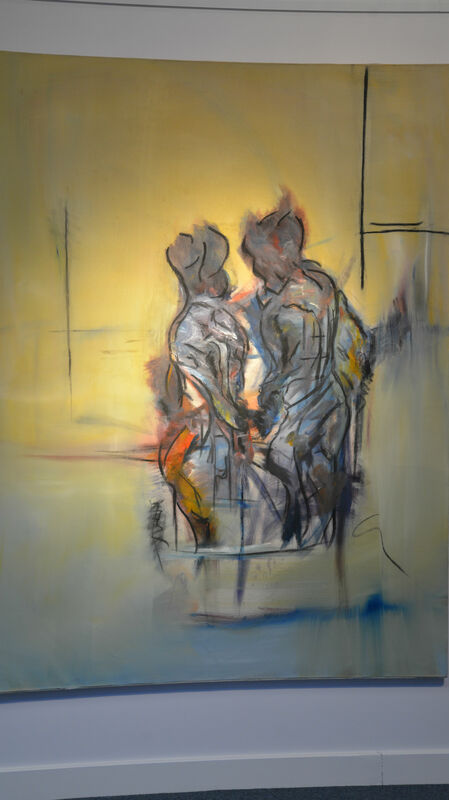 Working in oils and charcoal on canvas, Chris is ‘concerned with the notion that a stranger is an abstract ideal’. Sketches of strangers form the basis for paintings that focus on the ‘form and presence rather than the identity’ of the figures portrayed. 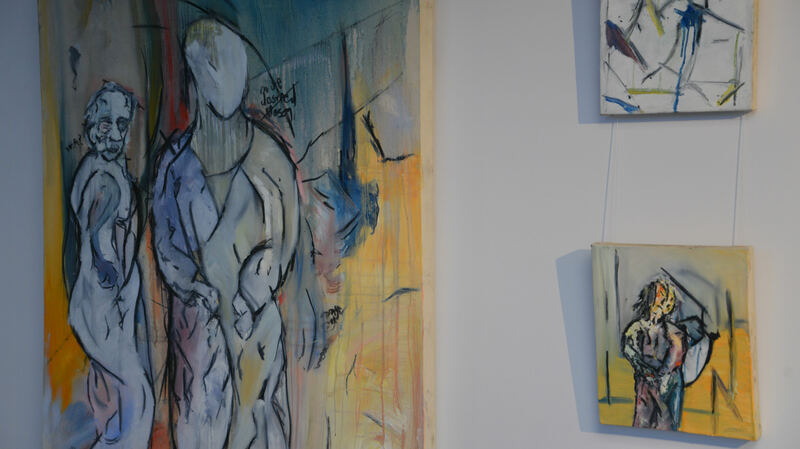 I found that the longer I stood in front of the paintings the more I was drawn into them – appreciating the juxtaposition of the fact the figures were represented as shapes, but to me, they seemed to be having a conversation – really thought-provoking! Kate graduated from Loughborough University. 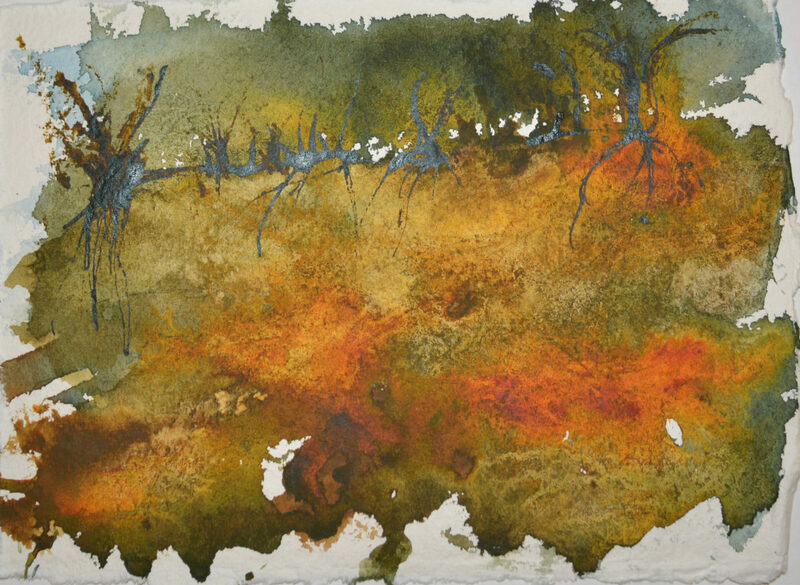 Her interests lie ‘within the cross-over between nature, colour and painting, seeking to express the beauty of nature through the medium of paint’. 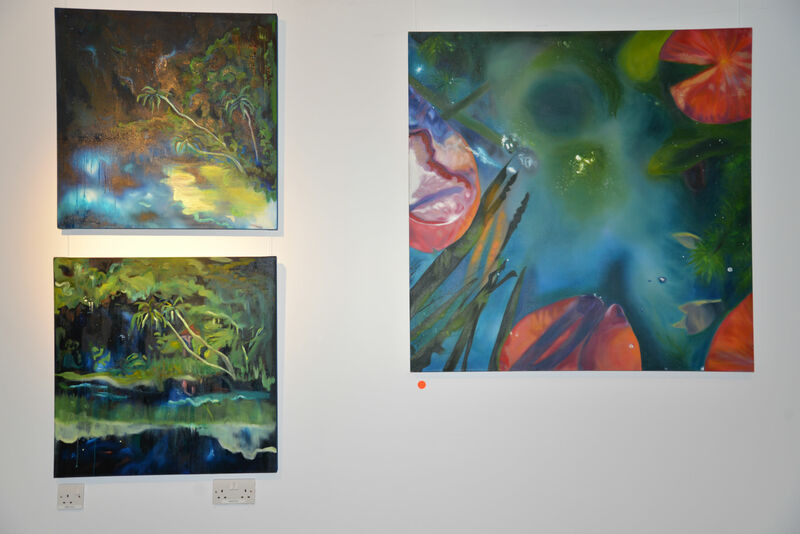 Taking her inspiration from the landscapes around her, she produces semi-abstract paintings using vibrant colours to portray the abundance and profusion of nature – to such great effect that you feel like diving right in, taking a deep breath and inhaling all the wonderful perfumes the paintings capture! Alongside the art exhibition, Blue Owl Art also sell craft based items including jewellery by Sheila Kerr, Gill Pottle and Rachel Jones, (got my eye on some beautiful ear-rings), porcelain ware by Perin Towlson and Katharina Klug, hand printed items by Andrew Berwick, wonderfully quirky objects by Helen Russell and items such as lamps made from re-cycled objects as well as hand-made greetings cards by Carrie-Ann Coupe to name but one of the talented designers . If I’ve missed anyone off the list I apologise – you really need to visit Blue Owl Art to see the whole range!!! The opening night of Blue Owl Art was a great success; lots of people attended the event and equally as exciting – sales were made!! This first exhibition runs until the 5th September 2014. 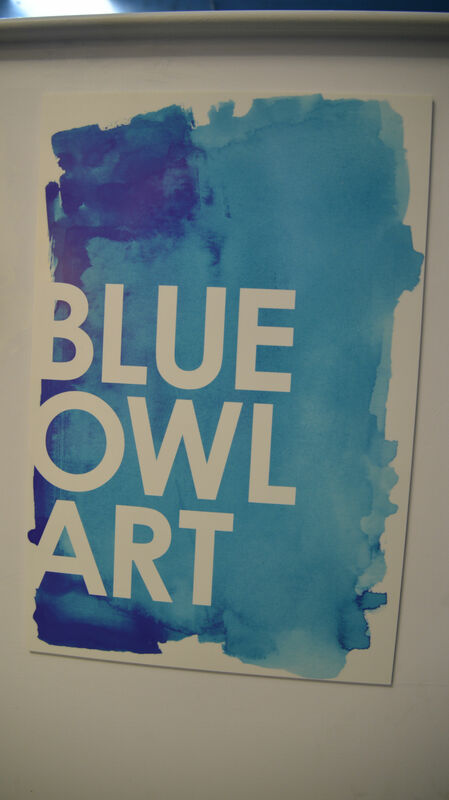 Jette and Belinda are planning a programme of exhibitions, events and workshops in the future; see their website www.blueowlart.co.uk for more information – or follow them on Twitter – @BlueOwlArt or Facebook – BlueOwlatGTC – well worth a look! Well ladies, you’ve done it! Huge congratulations and every success in the future – Blue Owl Art has certainly put Grantham on the artistic map! Around the middle of April I was contacted by Vivienne Hollis, an artist and founder member of ‘Artists Who’, a small collective of artists based in London. She had seen my work ‘Connecting Threads’ and was interested in finding out more about it as she is intrigued about the narrative behind such work. History and nostalgia feature in her work which is full of intricate detail based on life experience and memories. 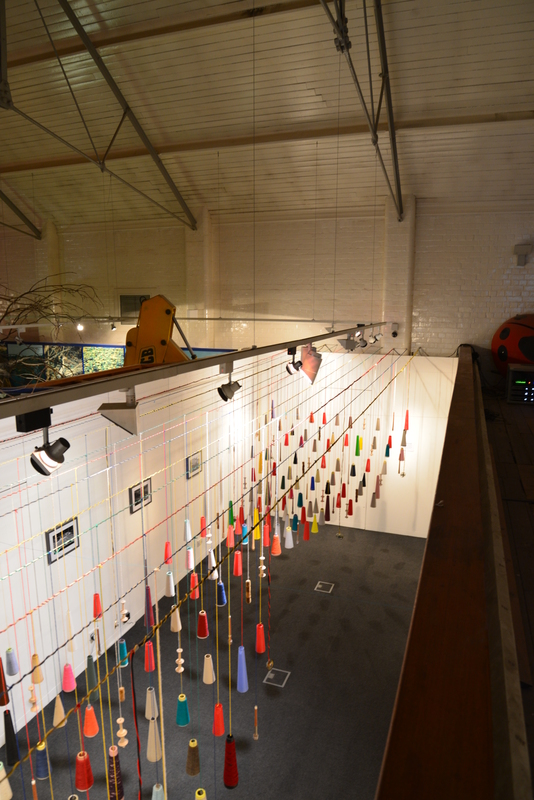 After several emails, Vivienne has written the following blog piece about Connecting Threads. As I explained to Vivienne, I have worked on this installation for so long and obviously have my very own personal take on it, that it is really interesting to hear how other people react to it and how it inspires them – what a compliment!! 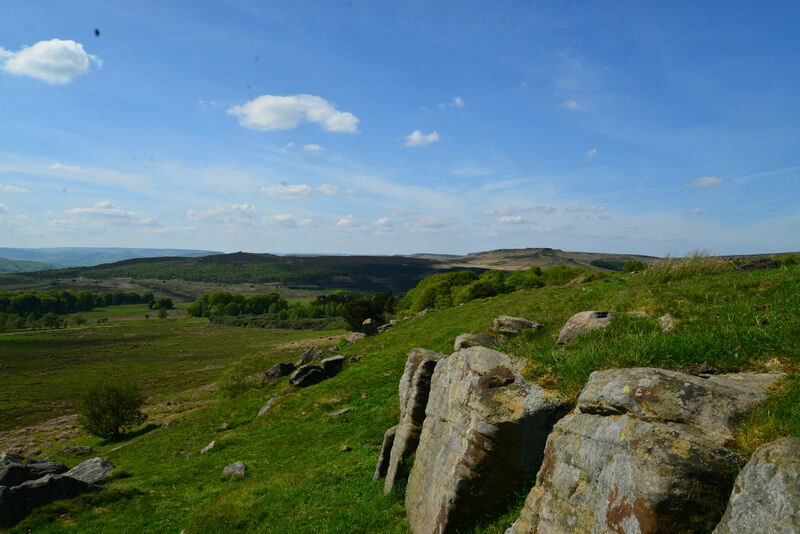 Inspired by the glorious weekend, we got in the car and headed north – our destination was the National Trust’s Longshaw Estate in Derbyshire – our intention was the 4 mile walk around Padley Gorge. On the way we stopped at the Chatsworth Farm Shop & Restaurant for coffee and and to pick up some tasty treats to add to our picnic! Leaving the car in the cool shade, we headed off -sunshine, blue skies, & enough breeze to carry the song of the skylarks…heaven! After walking through woodland, along the stream that lots of families were enjoying, we headed into the Gorge proper! 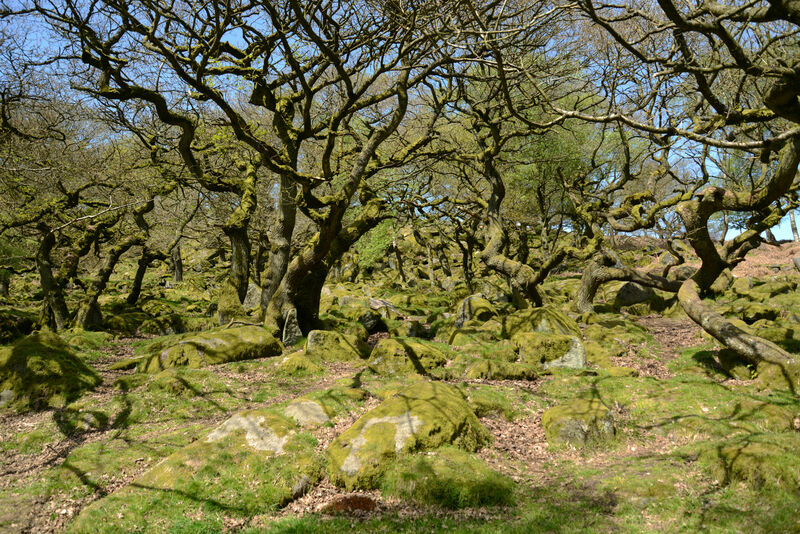 What fabulous trees, gnarled and moss covered – like some living fossils from primordial times. 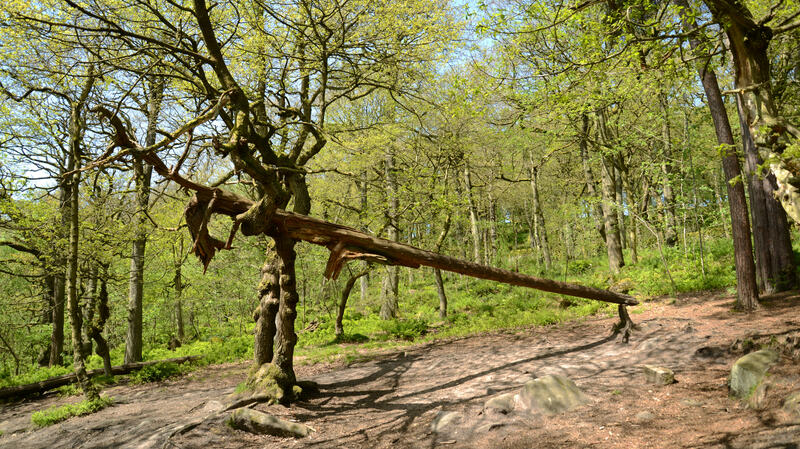 The sound of the water, the dappled shade – wonderful – and even when the trees had fallen, they appeared to arrange themselves in some type of natural installation! A word of warning though, if you sit for a drink and a bite to eat, mind you don’t get nipped by some of the largest ants I’ve seen in the UK! 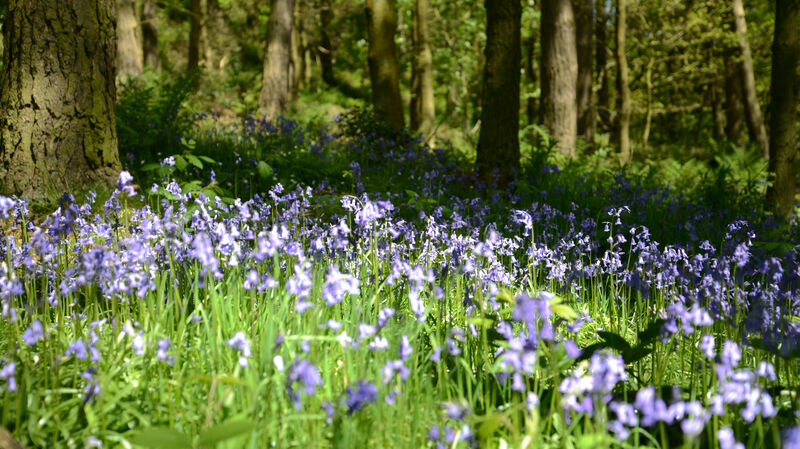 Emerging from the Gorge, passing beautiful bluebells in the sunlit glades, we arrived in Grindleford, stopping off at the Station Cafe for a reviving cup of tea (I know, all we seem to do is drink tea & coffee!) 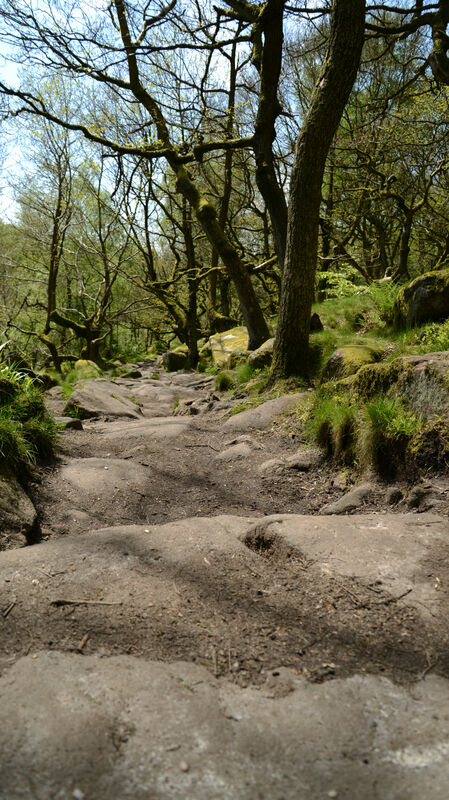 – which was just as well as the next part of the walk involved a 600ft scramble up the other side of the Gorge – the rough hewn steps are definitely not designed for people with short legs like me!! But at the top you are rewarded with some fabulous views across the valley – once you get your breath back! From there it was a gentle stroll back across open land dotted with trees & rhodedendron shrubs, where we heard, for the first time in a long while, a cuckoo loudly proclaiming it’s presence. We had certainly ‘walked up’ an appetite and was well ready for our tasty picnic! We then headed out again, up some more of the stone steps, to a fantastic vantagepoint where I took the opportunity to sketch. What a fabulous day! 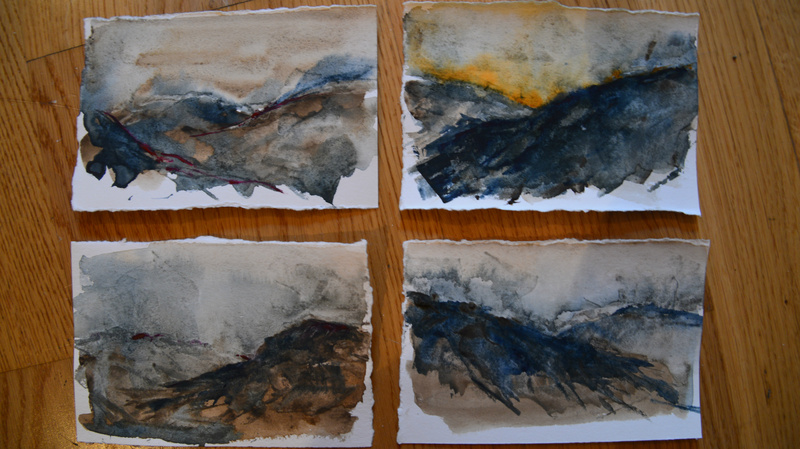 And here are some small studies inspired by the uplands of Derbyshire! Roll on the sunshine so we can have more incredible days like this one!